The whole point of keeping the soldering iron tip clean is to protect it against wear which can lead to tip failure. There is an argument to be made that it is better to use a brass wire sponge instead of a moist cleaning sponge. Using the moist cleaning sponge on a hot soldering tip can cause thermal shock and micro fractures. 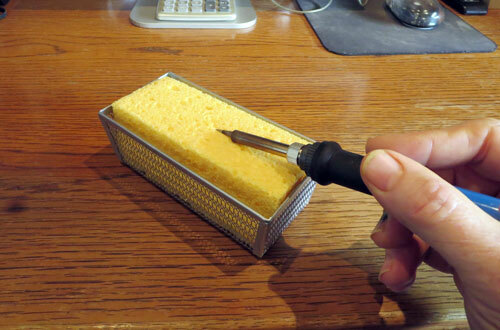 (source: https://www.sparkyswidgets.com/hakko-fx-888d-review-and-soldering-tip-care/) Still a moist soldering sponge is useful accessory to have for some tip cleaning situations. 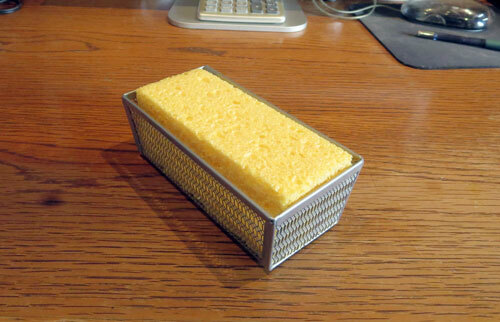 I prefer a large cleaning sponge over the small ones that fit on a soldering stand. The main reason is that the built-in sponge tray of a soldering stand has to be designed with high enough raised edges to keep the sponge from getting pushed out of the tray when it is wiped with a soldering iron. That’s my main concern. I found that the built-in sponge trays in many soldering stands were pretty useless for that reason. So I set out to find my own solution. I wanted the tip cleaning sponge tray to be deep enough and big enough so that the sponge wouldn’t slide out or the tray wouldn’t move around when I used it. I found a suitable tray at Bed Bath and Beyond. It is called a “mesh bin” and it is made by Copco. The tray is heavy enough and deep enough plus it has rubber feet to keep it from sliding around when cleaning the soldering iron tip. Next I had to find some good sponge material. Tip cleaning sponges are made from cellulose. I found a good cellulose sponge by 3M. It’s their No. C41 Extra Large Commercial Sponge. I picked one up from a local hardware store. I’m sure they can be found at most good hardware stores. The two larger pieces fit right into the tray. The smaller piece will also work. Simply moisten the sponge and wring it out. You don’t want the sponge to be wet, just moist, so there is no need for the tray to be water-tight. 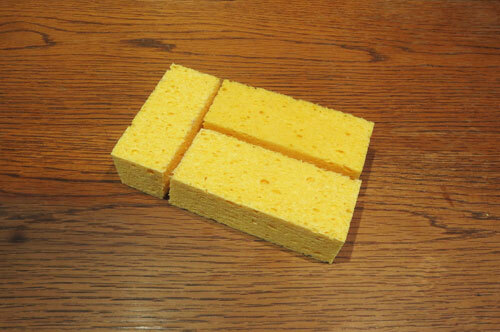 The sponge can be turned over up to four times before discarding it. I found this to work really well for me.